Someone else trying to make a buck again and claim once again it is fake. 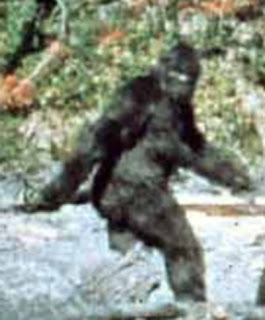 The man that was supposed to have been the creature is not even anywhere near the size, and to this day forensics and researchers can not create this. Your hoax film is a hoax. I hope it flops. I thought I heard that they think Patty was only around 6'2" now. Never underestimate humans. One more thing, anyone can try and fake a creature there is even an article on the side of this page talking about someone in a bigfoot suit doing something stupid. Dr Melba Ketchum's DNA tests do not lie, and neither do the the thousands of people who hear them, see them and deal with them throughout the forests of North America and Canada. Instead of wasting time criticising, wouldn't money better be spent on a team going out in the woods for months at a time instead of the weekend warrior packages? These things follow certain types of foods that grow, live in certain types of areas, have a language and more than likely bury their dead. We are talking about a type of human superior to us, that went in to the forests thousands of years ago, and has purposely avoided us. I'll believe your hoax video after you spend your time showing me proof it doesn't exist. Melba has proved nothing except that she is bad at this whole DNA thing. I agree, we should be sending people out for longer periods of time. Anyone with the common sense of a goose,can watch the subject in the Patterson film a few times,and then watch Bob H. Walking a few times,and make the startling conclusion that Bob cannot match the creatures stride. And yet no one has offered to show this,,hhhmmm. More than likely,,for a very good reason. The only hoax found here,as in the documentary,is the sham Bob H is trying to pull. Absolutely shameless. LOL!! !